The concept of relationship marketing has been discussed among marketing academics and managers since the early 1980s. But instead of reaching its maturity stage, relationship marketing is nowadays encountering its next upsurge. Due to a confluence of trends driving the global business world—including the transition to service-based economies, faster product commoditization, intensified competition worldwide, growth among emerging markets, aging populations, advertising saturation, and (above all) the digital age—strong customer relationships are more than ever vital to company strategy and performance. 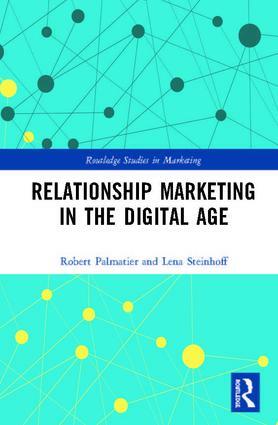 Relationship Marketing in the Digital Age provides a comprehensive overview of the state-of-the-art of relationship marketing, offering fruitful insights to marketing scholars and practitioners. In seven chapters, divided into two main sections on understanding (Part I) and effectively applying (Part II) relationship marketing, an introductory and a concluding chapter, readers learn how to successfully manage customer–seller relationships. Robert W. Palmatier is Professor of Marketing and John C. Narver Chair of Business Administration at the Foster School at the University of Washington. He founded and serves as the global research director of the Sales & Marketing Strategy Institute, a global organization focused on linking business and academics for knowledge. Lena Steinhoff is Assistant Professor of Service Management at the Institute for Marketing and Service Research at the University of Rostock in Germany. She is also an affiliated faculty of the Center for Sales and Marketing Strategy at the Foster School of Business at the University of Washington. This series welcomes proposals for original research projects that are either single or multi-authored or an edited collection from both established and emerging scholars working on any aspect of marketing theory and practice and provides an outlet for studies dealing with elements of marketing theory, thought, pedagogy and practice. It aims to reflect the evolving role of marketing and bring together the most innovative work across all aspects of the marketing ‘mix’ – from product development, consumer behaviour, marketing analysis, branding, and customer relationships, to sustainability, ethics and the new opportunities and challenges presented by digital and online marketing.